Manon Braat in conversation with the South-African artist Khanyisile Mbongwa. We’ve agreed to meet at Haas, a hip spot at Buitenkant Street in Cape Town that functions both as coffee shop and art gallery. I have a hard time recognizing her because the long black tresses Khanyisile Mbongwa (1984, Cape Town) had the last time I saw her, made way for super short white curly hair. The elegantly shaped vintage glasses on her nose are also new. She needs coffee and something to eat first – she just rushed down here from her studio around the corner where she had another interview, about a puppetry project called Slyza Tsotsi that will be part of the Cape Town Carnival 2016. 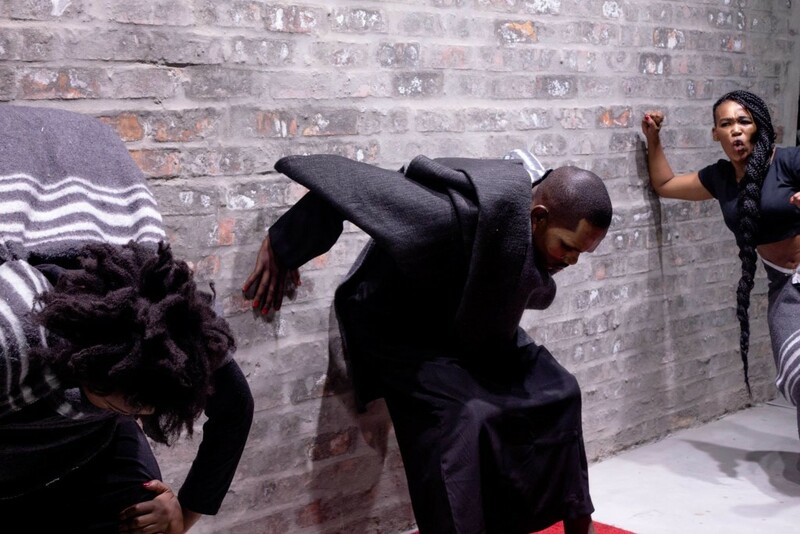 Apart from curating exhibitions, Khanyisile works as a performative installation artist, mostly using the body, photography and video. She never went to art school but she grew up dancing ekasi (township slang) and performing poetry for as long as she can remember, just never called it art. Already at an early age she gave workshops for writing and poetry in her home. Her professional practice evolved naturally from that. And it’s always been about finding creative ways of communicating with people, engaging with her surroundings and telling her story. 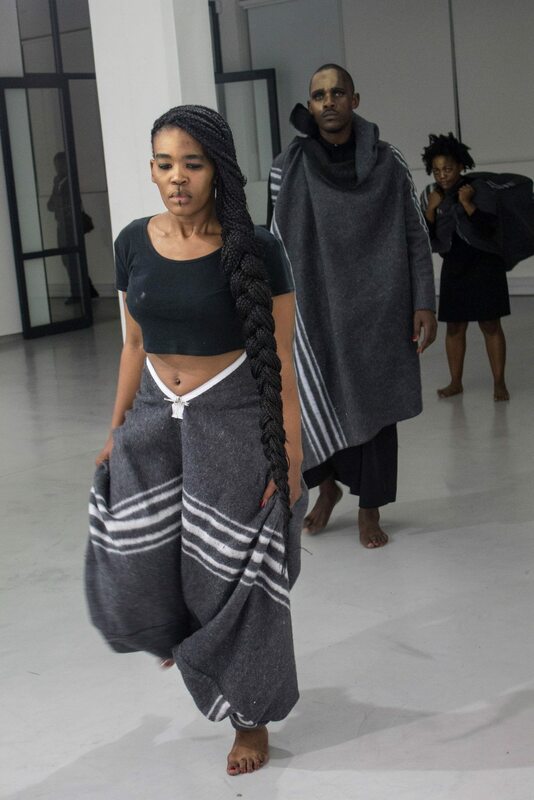 In her work ‘Iindonga’ (2014) she uses poetry and performance to address the struggle of young black South Africans to shape their identity in a post-apartheid South Africa. In the piece three young people, Khanyisile being one of them, are surrounded by historical walls of oppression, concrete monuments that serve as reminders of the past but at the same time symbols of the socio-economic and cultural walls that most black people still experience in South Africa today. Before she did an Honor in Curatorship program at the University of Cape Town she studied Sociology at the University of Stellenbosch. She’s interested in how society develops through creative actions. Art, she says, has a part to play in redressing the present issues of poverty, racism and inequality that South Africans as a society have failed to deal with. Both her art works and her exhibitions mainly deal with the socio-economic and political conditions of race, gender, sexuality and geographical location. In her case that means being black, female and coming from a township. She moved to the city not too long ago, but grew up in Gugulethu, in Xhosa meaning ‘our pride’. ‘Gugs’ as she calls it, is a township on the Cape Flats situated 15 kilometers south-east of Cape Town. 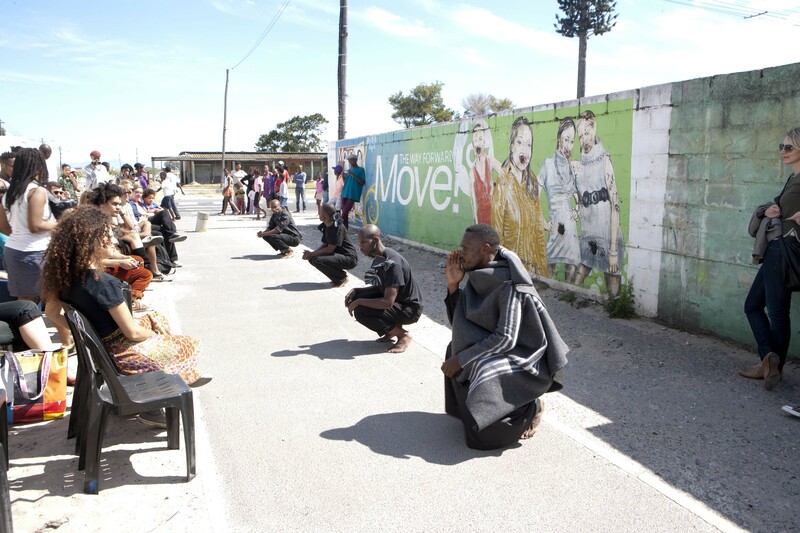 The township and the commodification of township blackness in the tourist industry was the subject of Demonstrations: Performing Being Black, a two-part exhibition Khanyisile curated in 2013. A photographic exhibition in Gallery Brundyn showed works of photographers who had all been tasked to produce one ‘authentic image of the township blackness’. 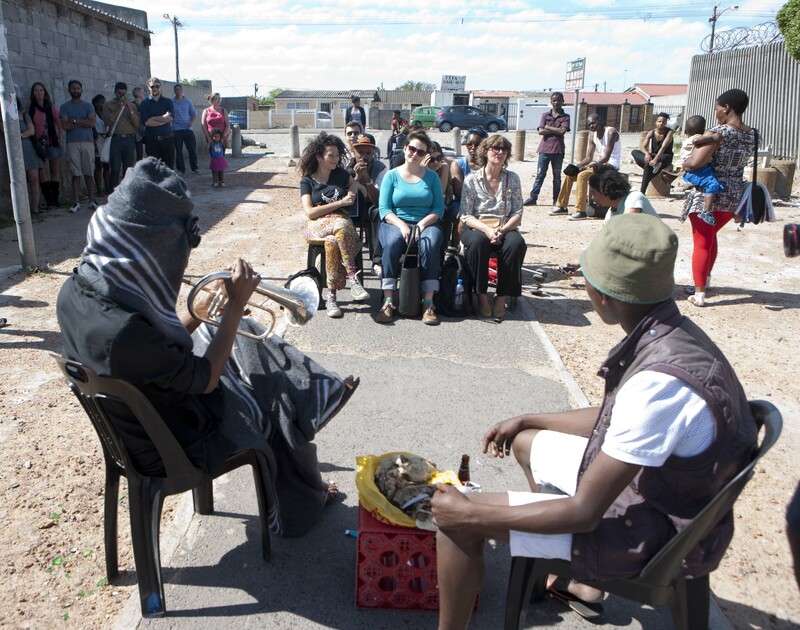 The second part of the exhibition mimicked ‘township tours’ as a critique of them and consisted of a series of performances in selected alleyways in Gugulethu where the audience could view and experience ‘authentic township blackness’. In her early thirties now, she decided to go back to university and do her Masters in Interdisciplinary, Live and Public Art and Public Spheres at the Gordon Institute for Performing and Creative Arts, also part of the University of Cape Town. But these days she’s mostly busy working for the Handspring Trust for Puppetry Arts, of which she’s been appointed executive director little over a year ago. 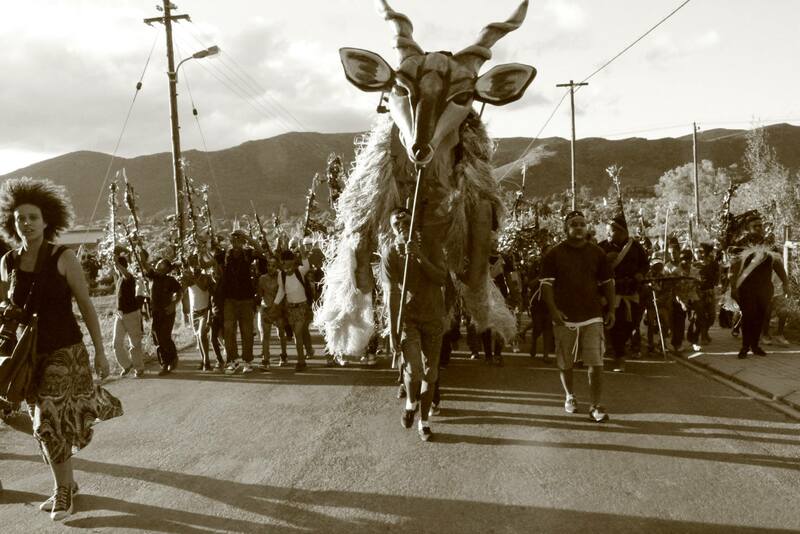 Only two weeks to go until its 12 March, the day of the Cape Town Carnival, and Khanyisile’s building a giant puppet that will be part of the procession through the city center streets. “This year’s overall theme of the carnival is Street Life. It is a concept that is relevant to the city and to the history of South Africa, highlighting how every member of our society should have a street that they can call home within our eclectic city. 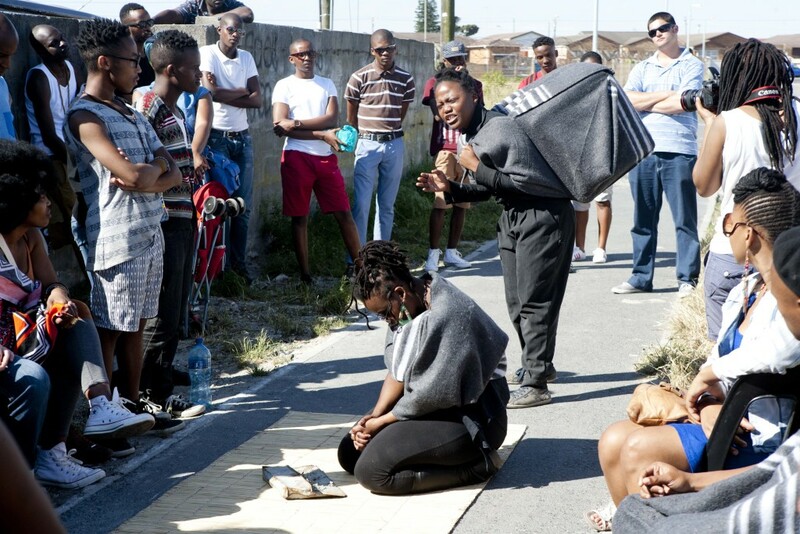 The puppet that we built (together with UKWANDA Puppet and Design Collective) for it is called “Slyza Tsotsi”, which is very rooted in township culture and deals with the way in which townships are built and its inhabitants negotiate the space. 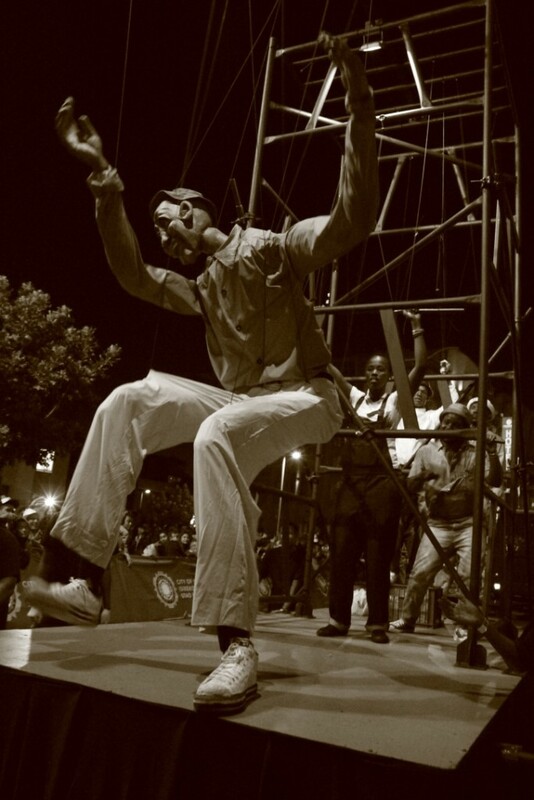 The term Slyza Tsotsi was made incredibly popular last year by hip hop duo Major League. Slyza means to escape, to find a different route. The township is built with all these small passageways where you can easily get trapped. Tsotsi, a slang word common to most Southern African languages, mostly refers to ‘gangster’ but it can also mean ‘street wise’. So the Slyza Tsotsi character knows his environment and how to navigate through it, he knows the in and out and is constantly aware of his environment and himself. 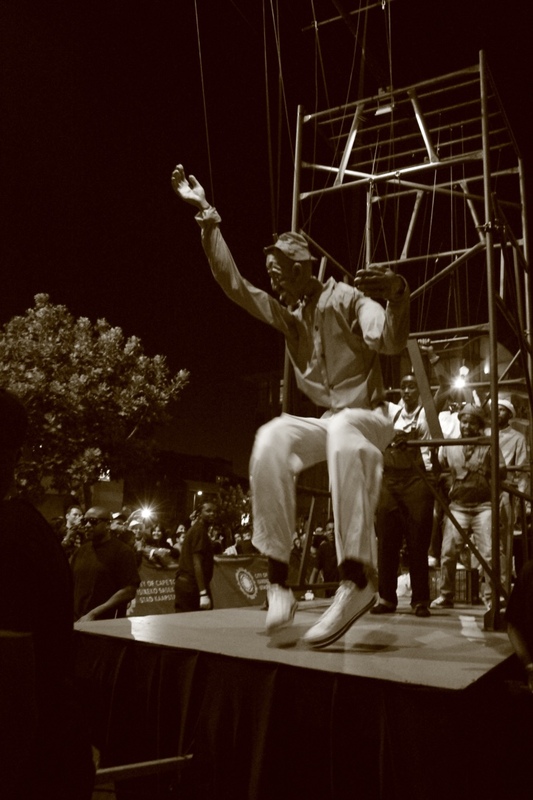 The puppet dances the Patsula, loosely translated waddling like a duck in the isiZulu language, a dance style that quickly evolved into a lifestyle and that emerged in the 1950s and 1960s as a response to the forced removals of non-white people from their land and homes. In the post-94 context Slyza Tsotsi tells the narrative of black township life, the violence that comes with it and the ways in which we find an escape by constantly negotiating our environment. Slyza Tsotsi brings into question the historical legacy of public space in Cape Town and how the black body is seen in such spaces. I am one of those people who left. Because I was raised by my grandmother and she worked as a nurse in Sea Point in the city of Cape Town, I was brought to school there. From a very young age I was exposed to the architectural and spatial differences between the city where white people lived and the township where we lived. And I had to manoeuver through these different worlds for a long time, experiencing this duality of being that exists. To Khanyisile the puppets are extensions of who we are. 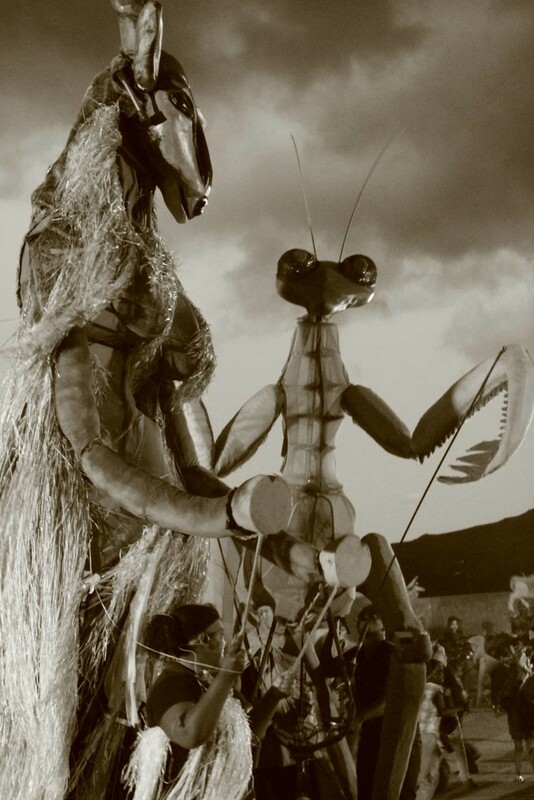 They are life size or even bigger, giant, human looking puppets. The idea is to create a puppet that embodies a person and then manipulate it so it can transcend human’s physical, psychological and emotional limitations. Puppetry creates the opportunity for the manipulator of the puppet, and the audience, to go somewhere where they normally can’t, to an imagined future, a place beyond the current reality. Khanyisile states that she lives in two South Africa’s. The official one that you can see in the catalogues, with the beautiful scenery, the wild life, the great food. And then there’s the real South Africa. People have been existing in these two places for a very long time. The divide, according to Khanyisile, is only becoming more visible now because the real South Africa is running out of patience. The level of tolerance is breaking because democracy has failed the country. After 22 years things have not shifted and black anger is growing. But of course, black people demanding equal chances and fighting white privilege is nothing new, she stresses. “I’ve been brought up in the township and I was active in the ANC youth movement and these discussions have always taken place, amongst all groups of black people. The fact that domestic workers and miners are protesting against low wages and bad working conditions and that students are fighting for the right to be properly educated didn’t come out of nowhere all of a sudden. The radical changes that were needed and promised after the abolition of apartheid to a large extend didn’t happen. But what we see now is white privileged people telling us ‘to get over it’’, that apartheid is over and that we should make a future for ourselves. Yet the reality is that the majority of the black people still lives under extremely poor conditions and don’t have the opportunity for social mobility. There’s too much backlog. So most people cannot ‘get over it’ because they are still living the aftermath of apartheid. Because she’s a student herself again, she engages with the student protests, the #FeesMustFall and #RhodesMustFall campaigns that are going on all through the country for the past months and demand equal chances to study at universities and ending institutional racism. Black South Africans have a history of Bantu education (2), most parents are not educated. The students want the opportunity for all the young people in the country to be educated. Khanyisile refers to the Freedom Charter in this respect that says that all shall get education. (3) The government and the institutions of education should make sure that they have the necessary means to insure that everybody will be educated. Reality is that there are only few scholarships available and that going to university is much too expensive for most black South Africans. Khanyisile is convinced that it’s possible for the government and the universities to find a solution and that students should continue to protest until their demands are met. Her own activism in the protests is of a specific nature, and happens within the group. 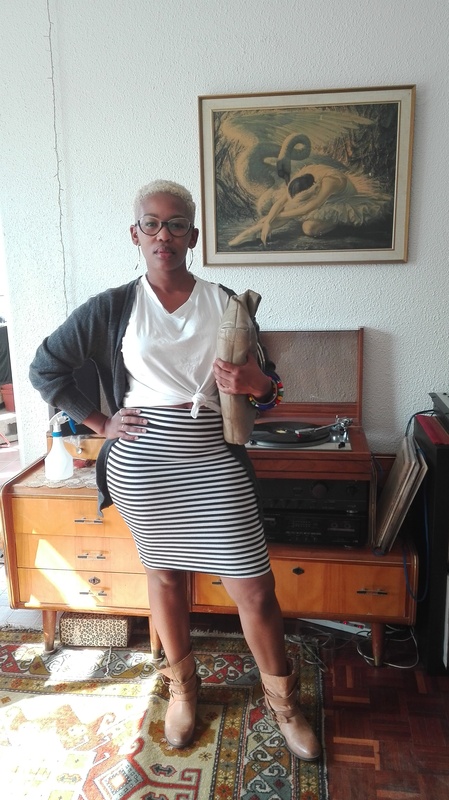 Khanyisile strongly advocates self-love and the conviction that revolution needs to happen without any more black bodies dying. “So far the protests have been relatively peaceful; violence has been exerted only against structures that remind black people of the oppression from the colonial and apartheid regimes, such as paintings and statues of white colonial rulers. But every time they protest, the police uses fierce violence against the black students. It seems only a matter of time before blood will be spilt. When she was young Khanyisile’s idea of revolution was to get everyone out of the townships as soon as possible. Now she feels this is something that people should want for themselves. It can only happen if they believe that they’re not stuck there, just because the system is built to make them think that this geographical location is who they are and where they belong. Self-love, Khanyisile is convinced, compels you to try to image beyond this reality. Even if you don’t get to see the future that you’re imaging, those that come after you can. The township will continue to play a very important role in Khanyisile’s life and practice. Her mother, sister and son still live in Gugulethu. She still feels strongly connected to this place of her youth that was beautiful and extremely violent at the same time. She’s trying to understand the space of the township as someone who lived in it and doesn’t live in it anymore but still has strong ties. 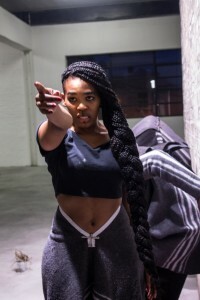 Her masters research is looking at township alleyways, the irhanga, as ways to engage with the black psyche and identity – finding other ways to engage with who we are as black people who emerge from such spaces that were designed to keep us static, docile and locked in structural oppression. 1. The Truth and Reconciliation Commission (TRC) was assembled in South Africa after the abolition of apartheid. Victims of human rights violations were invited to give statements about their experiences, perpetrators of violence could also give testimony and request amnesty from prosecution. 2. The stated aim of Bantu education by the apartheid government was to prevent Africans receiving an education that would lead them to aspire positions they wouldn’t be allowed to hold in society. Instead Africans were to receive an education designed to provide them with skills to serve their own people in the Bantustan ‘homelands’ or to work in manual labor jobs under white control. 3. The Freedom Charter was the statement of core principles of the South African Congress Alliance, which consisted of the African National Congress (ANC) and its allies – the South African Indian Congress, the South African Congress of Democrats and the Colored People’s Congress. It was adopted at the Congress of the People, Kliptown, on 26 June 1955 and is characterized by its opening demand; “The People Shall Govern!” The new Constitution of South Africa, after the first democratic elections were held in South Africa in April 1994 and the ANC came to power, included in its text many of the demands called for in the Freedom Charter. Nearly all the enumerated concerns regarding equality of race and language were directly addressed in the constitution, although the document included nothing to the effect of the nationalization of industry or redistribution of land, both of which were specifically outlined in the charter. Manon Braat is art historian. She is a freelance writer and critic working for several magazines and institutions.